“Coe v Ovett” – it was a phrase that defined the golden era of British athletics, but in the most basic of ways it is a misnomer. There was very little Coe v Ovett. As British athletics writers chased them around the world, Sebastian Coe and Steve Ovett raced each other only seven times â€“ the first in a schoolboy cross-country, next in the European 800 metres final in 1978, then four Olympic finals, and last the race which put a full stop to the rivalry, the 1989 English Commonwealth 1,500 metres trial. I remember, too, our next door neighbour when we lived in Surrey. â€œWas that Seb Coe I saw going into your house yesterday,â€ she said when we had the neighbours in for drinks. When I replied that indeed it was, this stolid middle-aged, middle-class woman blushed like a teenager. â€œJust think I’m sitting on the sofa that Seb Coe sat on,â€ she twittered. I didn’t tell her that her husband was sitting on the exact spot that the Coe bottom had occupied. I don’t think any of us could have coped if she’d changed places. Then there was the class issue. Coe, a university graduate, was supposed to be middle-class; Ovett the son of a market trader, was supposed to be working class. True but not true. 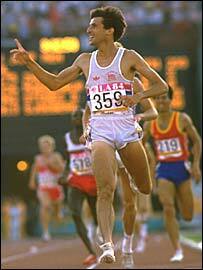 Ovett lived in effete southern Brighton, Coe in gritty northern Sheffield. South v North? You could twist the cliches whichever way you wanted… and believe me we did. I got on well with both but as sports editor of United Newspapers from 1980 to 1983, I had two papers in Sheffield â€“ so I wrote a lot more about Coe. They should have raced each other much more often. After all Sweden’s Gunder Haegg and Arne Andersson chased the four-minute mile barrier against each other throughout the Second World War â€“ they didn’t get it â€“ but perhaps that was because there was no one else to race against. It was different for Coe and Ovett. In Britain alone there was Dave Moorcroft, Steve Cram, John Robson, Graeme Williamson, Steve Crabb and then Peter Elliott. What we would give for even one of those today. Of course, Coe and Ovett were kept apart. The athletics Svengali who made sure they didn’t run against each other was Andy Norman, who acted as agent for Ovett. Amazing to think that in this, the greatest of athletics eras in this country, the strings of the commercial circuit were pulled by an overweight police sergeant from behind his desk at Penge nick. THEY WERE DUE to race each other three times in 1982. There was to be a series sponsored by Citizen â€“ the bedside clock they gave to me and the rest of the press on the day of the launch lasted until a couple of years ago. The idea, if memory serves me, was for an 800 metres, a mile and finally a 3,000 metres. A bad knee injury suffered by Ovett when he ran into some church railings in Hove put paid to the first two, and he was never really fit. He had to drop out of the last, the 3,000 metres, in Eugene, as well as did Coe, although Ken Mays, of the Telegraph, Neil Wilson, of the Mail, and I ended up in Oregon anyway because it was cheaper to send us there on the way to the Brisbane Commonwealth Games than rearrange our air tickets. Coe and Ovett’s first meeting was over four miles in the English Schools Cross-country Championships of 1970. Ovett finished second and Coe 10th. Not surprsingly it was Ovett, 11 months the elder, who strode first on to the world stage. After a 800 metres silver medal at the 1974 European Championships, Ovett was regarded as a medal chance when, still only 20, he went to the Montreal Olympic Games in 1976. There, he was fifth in the 800 metres and lasted only one round of the 1,500 metres. The following year, Ovett lost an early race in Jamaica but he was then unbeaten at 1,500 metres for three years, until the 1980 Olympic final. Coe, in the meantime, was creating his own splash. His bright purple Loughborough vest could be seen at the front of big races â€“ notably the Emsley Carr Mile in 1976 â€“ before stronger, more experienced athletes caught him. But then in early 1977, he won his first European Indoor title, at 800 metres. He won the Emsley Carr race later in 1977 and from then on Britain had two middle-distance superstars. And let’s face it, the milers and the sprinters are the athletes the public goes to see. Coe and Ovett’s meeting the following year in the European Championships in Prague was an anti-climax, although it produced my first encounter with Steve’s fearsomely protective mother, Gay. She flew at me after I suggested Coe would win the 800, thinking her son would take the 1,500. I didn’t realise she was in the room at the time or I would have kept my mouth shut. Steve’s father Terry had to drag her off me. Ovett did take gold in the 1,500, a race Coe did not contest. THE NEXT YEAR, 1979, Coe broke three world records in 41 days â€“ 800, 1500 and mile â€“ while Ovett, in self-imposed purdah from the press, muttered something about world records meaning nothing, although he came mighty close in both the mile and 1,500 metres later that year. And in the build up to the 1980 Olympics, Ovett, wearing his favourite scarlet Soviet vest, set a world mark for the mile in Oslo. Even then Coe had got in first, running a world record for 1,000 metres at the same Bislett Games. It set the scene for Moscow. These Olympics were affected by the US boycott but no one from America, except maybe Don Paige in the 800, would have challenged Coe and Ovett. Ovett avoided the media when he arrived in Moscow, but they held a press conference for Coe, unheard of at the time. The game was on. I can’t ever remember feeling nervous in a press box before, but I was then prior to the 800. I wanted Coe to win because it meant better copy for the Sheffield Star and Telegraph. What did I know? Coe cocked up his tactics and Ovett, looking surprised, won gold. Coe ran on for silver but when he was handed the medal on the rostrum, Clive James, at the time the Observer TV critic, memorably wrote that it looked: â€œAs if he had been handed a cold turdâ€. By being able to run the 1,500 metres four days later, Seb Coe was a lucky man. Most athletes have to wait four years to make up for an Olympic disaster. It gave us four days to speculate and in the end both men won the â€œwrongâ€ event. In an even more feverish atmosphere, Coe benefited from East German Jurgen Straub’s decision to blast a fast third lap and he double kicked to win, with Ovett third. On the Saturday morning, I went to the athletes village to talk to Coe and had to wait while he had breakfast with Allan Wells, another who had won the â€œwrongâ€ event. He’d been expected to win the 200 metres but won silver in that and gold at 100. Ask any sprinter and middle distance runner what medals they would prefer and the answer will be 100 and 1,500. Later that summer, Ovett went on to break the world record for 1,500 metres in Koblenz but it couldn’t have made up for defeat in the Olympic final. IN 1981, OVETT ENDED his feud with the press. He had a range of sports clothing to promote and you can’t do that if you don’t talk to the media. So Andy Norman arranged a series of interviews. Pat Collins, then on the London Evening News, was first, I was second. Not surprising really. Two papers in Sheffield. Andy Norman wanted to wave his man in front of Coe. Maybe I’m being unkind but what I never told Ovett was that I forgot to turn on my tape recorder for the first half of the interview. Ovett looked at it and said a red light was flashing. â€œIt needs turning over,â€ I lied. Fortunately I took notes as well. The resulting article didn’t faze Coe. In 1981, he set three more world records. First the 800 in Firenze, a mark which would stand for 16 years, then the 1,000 in Oslo before breaking Ovett’s mile record in Zurich. I missed the 800 â€“ the only British pressman there was Vic Robbie of the Daily Mirror â€“ and the 1,000. I’d watched Coe go close to the 1,500 metres world record in Stockholm on the Wednesday evening and afterwards he blamed bad pacemaking, although it was still a personal best. Would he go after the 1,000 metres record in Oslo on the Saturday? â€œNo chance. You’ve only got a certain number of performances in your legs and I used up one of mine tonight.â€ Of course, he broke the 1,000 record on the Saturday and that stood for 18 years. Before Brussels though was Koblenz and Ovett’s turn. There was no mile on the Koblenz programme but Andy Norman could be very persuasive and besides, what promoter wouldn’t want a world record attempt at their meeting? Ovett, aided by Bob Benn, his personal pacemaker from Croydon Harriers, took 0.13 seconds from Coe’s seven-day-old record. But Ovett was nowhere to be seen and the two were destined never to meet over that most British of distances, the Imperial mile. While Ovett was incapacitated, Coe did rescue something from 1982, taking part in the 4×800 metres world record at Crystal Palace with Steve Cram, Garry Cook and Peter Elliott but he suffered defeat in the Athens European Championships 800 metres at the hands of Hans-Peter Ferner of West Germany. His father Peter sat next to me during that race and neither of us could believe that once his son had kicked for home anyone would catch him. But nobody knew that he was already suffering from the glandular fever that prevented him running at the inaugural World Championships in Helsinki in 1983. In first place was Steve Cram, who had been around since 1978 when he ran in the Edmonton Commonwealth Games as a 17-year-old. The old order had changed. I missed the Los Angeles Olympics (a combination of redundancy and the need to earn money kept me away) but I like to think that Coe would not have gestured so angrily towards the press box after he became the first man to retain an Olympic 1,500 metres title had I been there (That’s a joke). Earlier, he had again been beaten into second place in the 800 metres, by Joaquim Cruz, of Brazil, but there was no turd this time. The silver medal was happily accepted â€“ the 800 had been a means to an end. Ovett, the defending champion, had finished last in that and was taken to hospital suffering from bronchial problems and dehydration. But he amazingly he still made the 1,500 final and he was the world record-holder. Sadly, the illness took it’s toll although on the third lap there was the wonderful sight of Coe, Steve Cram and Ovett in single file at the front of an Olympic 1,500 metres final. Ovett had to drop out, injury had hampered Cram’s preparation and there was no one to stop Coe scampering home and rewriting history. There is a great AllSport photo taken at the LA Olympics. It has Coe with a consoling arm around his great rival, showing that if there ever was any real animosity â€“ which I doubt â€“ it had all gone by then. THAT WAS VIRTUALLY the end of the Coe v Ovett story in terms of direct competition, although we weren’t to know it. There was one more race in which they both featured but the saga whimpered to a close. Great sportsmen rarely end on a high. Cram was now Britain’s best at the mile and 1,500 metres: in 1985 he became the first man under 3 minutes 30 seconds for 1,500 metres, chased home in an enthralling race in Nice by Said Aouita, of Morocco, and then in Oslo (where else? ), Cram seized the mile world record in a race where he beat Coe and one of the most stellar fields assembled. Not that Coe was finished. In 1986 he had to stay in bed ill as Cram racheted up the pressure by winning the Commonwealth 800 and 1,500 in Edinburgh, a Games in which Ovett won the 5,000 metres. But come the European Championships in Stuttgart later that year, Coe had recovered. And for the world’s fastest 800 metres runner, there was a first major title at the distance. He beat Scotland’s Tom McKean and Cram on a rainy day which had the late Ian Wooldridge of the Daily Mail writing that coming off that final bend, they were â€œlike three Spitfires coming out of the sunâ€. Cram prevailed in the 1,500 metres final with Coe second, but Coe did have a world class 1,500 metres victory that year. It was at Rieti and there were only two British journalists there. I was one of them. I had rung Wilfred Meert, the former journalist who ran the Brussels meeting, to ask which event Coe was running. â€œHe’s not,â€ said Wilfred. â€œHe wants to concentrate on Rieti on Sunday.â€ I contacted Ken Lawrence, then sports editor of the Daily Express, and he told his secretary to rearrange my travel plans and get me to Rieti as well. His shoe company may have been Italian but even they would have understood that if they just wanted an exhibition, he could have run at Brussels as well. It turned out that he was inches away from the 1,500 metres world record. His 3:29.77 had been bettered only by Cram and Aouita in that epic race in the south of France. Afterwards, Coe was mostly concerned that a light-fingered Italian had made off with his favourite running vest, a pin-striped number that gave a clue to the sort of life he was to lead when he gave up athletics. It shows how relations were between Cram and Coe at that time when Dave Roberts, his manager, and Cram found out I’d got a hire car. â€œCan you give us a lift back to Rome?â€ asked Dave. â€œSure,â€ I replied. Having already promised Coe and his then girlfriend Jane a lift I wondered what would happen when I said, â€œIt’s big enough to fit five.â€ On hearing who were the other passengers they decided to make other arrangements. First, though, we had to go to Sandro Giovanelli’s party. He was an Italian athletics official who would later become competitions director of the world governing body, the IAAF. He lived in what was basically a magnificently furnished cave set into a hill. I wondered how an athletics official could afford such a place, but decided not to ask. Coe took over the driving on the way back to Rome, which didn’t concern me until it became evident that the route back from Rieti on a Sunday night is like the M25 at rush hour as everyone leaves their weekend homes for the big city. Coe solved that problem by driving on the wrong side of the road most of the way back. He stayed at my hotel and they made him carry in his own bags. Later that night we had a drink at the bar and he asked who I thought was the best middle distance runner of all-time. â€œHerb Elliott, without a doubt,â€ I replied without thinking. â€œI like to think I was pretty good,â€ he smiled. â€œIt’s a generational thing,â€ I said. The following year Coe was only commenting for the BBC at the Rome World Championships but you couldn’t keep him out of the news. I think, 20 years later, that the story can be told about how I was tipped off that two BBC commentators were threatening to down tools if Coe was allowed to comment on the 800 or 1,500 metres. An attempt to make a third Olympics ended for Coe in the sort of farce in which British athletics specialises. Coe had to drop out of the 1,500 trial in Birmingham because of a cold but the selectors voted 7-0 that he should compete in Seoul, deciding that unanimity was needed. The team then went to the 25-strong Board Council which voted 13-12 on the chairman’s casting vote that there should be one change â€“ Coe should not run. â€œHave you seen the size of his house?â€ was the reasoning of one of the anti-Coe voters. IOC chief Juan Antonio Samaranch floated the idea that Coe could run with a “wild card” entry as the defending champion but nothing came of it and Coe’s Olympic career was ended by petty-minded men and women. COE STILL WANTED to run in the Commonwealth Games in Auckland in 1990 and to do that he had to compete in the trials in Birmingham which were held as part of the 100th AAA championships in 1989. It was to prove an emotional occasion, and not just because it was his first AAA 1,500 metres title. If I can be allowed a little indulgence, I should say that I played a small part in the drama that followed. Despite the years of success, or perhaps sated by them, crowds at British athletics meetings were getting smaller and Andy Norman, now formerly employed as the promotions officer of British athletics, rang to wonder how he could sell the meeting. By now I was editing Athletics Today magazine. â€œCoe’s running but if they won’t come and see him what am I to do?â€ he asked me. â€œGet Ovett in the race,â€ I suggested. Norman had fallen out with Ovett and had not been connected to him for several years. â€œOvett? He’s finished,â€ Norman said. He wasn’t convinced but he contacted Ovett and they agreed he would run. The promised headlines were big. But on the morning of the race Ovett threatened to pull out. He’d been paid, he said, and Coe hadn’t. Why that should upset him I never found out, but after he finished ninth in a race won by Coe with a 51-second last lap following a mid-race collision which he narrowly avoided, Ovett was interviewed by Jim Rosenthal of ITV. Ovett broke down in tears, complaining about the way the affair had been handled. It was the saddest of ends to the greatest of rivalries. Coe went to Auckland but, suffering from respiratory problems, finished seventh in the 1,500 metres won by Peter Elliott. It was a low key end and Coe retired. Ovett followed suit in 1991. There is no doubt they have prospered since. Ovett moved into the developing business, emigrated to Australia and keeps his athletics connections through his talented children and with commentary work. Coe went on to become the Tory MP for Falmouth, a Lord and the man who drove London’s successful 2012 Olympic bid. It would be foolish to say we shall never see their like again, but it won’t be in my lifetime or, I suspect, in yours.